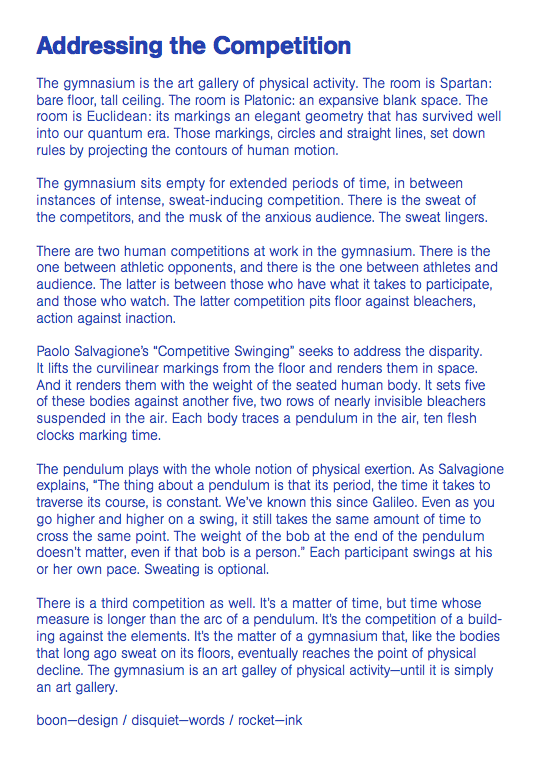 Written and letterpressed for work Competitive Swinging. The gymnasium is the art gallery of physical activity. The room is Spartan: bare floor, tall ceiling. The room is Platonic: an expansive blank space. The room is Euclidean: its markings an elegant geometry that has survived well into our quantum era. Those markings, circles and straight lines, set down rules by projecting the contours of human motion. The gymnasium sits empty for extended periods of time, in between instances of intense, sweat-inducing competition. There is the sweat of the competitors, and the musk of the anxious audience. The sweat lingers. There are two human competitions at work in the gymnasium. There is the one between athletic opponents, and there is the one between athletes and audience. The latter is between those who have what it takes to participate, and those who watch. The latter competition pits floor against bleachers, action against inaction. 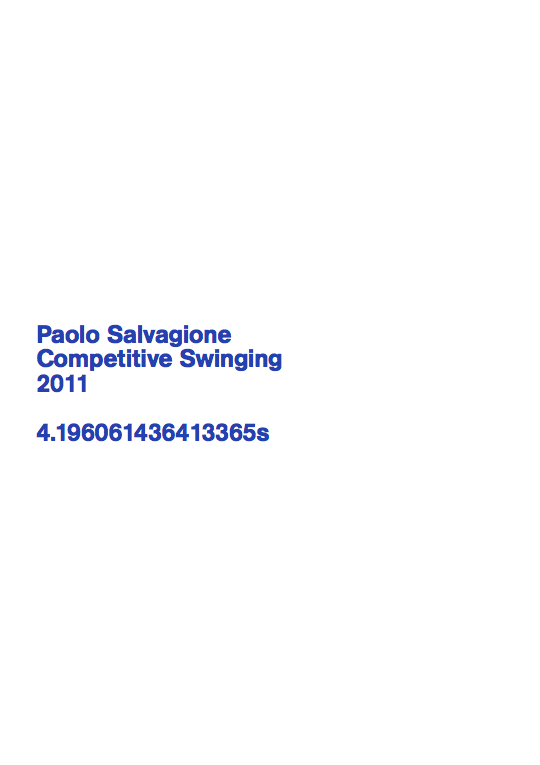 Paolo Salvagione’s Competitive Swinging seeks to address the disparity. It lifts the curvilinear markings from the floor and renders them in space. And it renders them with the weight of the seated human body. It sets five of these bodies against another five, two rows of nearly invisible bleachers suspended in the air. Each body traces a pendulum in the air, ten flesh clocks marking time. The pendulum plays with the whole notion of physical exertion. As Salvagione explains, ‘The thing about a pendulum is that its period, the time it takes to traverse its course, is constant. We’ve known this since Galileo. Even as you go higher and higher on a swing, it still takes the same amount of time to cross the same point. The weight of the bob at the end of the pendulum doesn’t matter, even if that bob is a person.’ Each participant swings at his or her own pace. Sweating is optional. There is a third competition as well. It’s a matter of time, but time whose measure is longer than the arc of a pendulum. It’s the competition of a building against the elements. It’s the matter of a gymnasium that, like the bodies that long ago sweat on its floors, eventually reaches the point of physical decline. The gymnasium is an art galley of physical activity-until it is simply an art gallery.